Will the Fed Turn Us Into Japan? I continue to believe the Fed will eventually need to send interest rates even lower, possibly to negative territory. Nobody wants a housing downturn or falling stocks. And if the Fed keeps hiking rates as it has been (and is supposed to do) recently, that’s almost certain to happen. Today the Fed is clearly worried that the U.S. economy is fragile, although officials aren’t likely to admit this anytime soon. Both the U.S. and Europe appear to be stuck with low interest rates. Neither economy appears able to handle a normal interest rate level, like 5% or 6%. In fact, parts of Europe are barely coping at zero percent rates, and oodles of new debt are piling up. The U.S. economy started to sputter when rates rose to around 2%. On both continents, growth is stuck around the same level as inflation – 2% if you believe the official numbers. And it’s not just the government and companies accruing debt. Consumer (personal) debt is climbing higher too. When you add debt, you automatically add leverage and increase risk proportionately. What’s going to happen? Nobody knows. But we can make some educated guesses. The best place to start is by looking at Japan, which has had ultra-low rates since the mid-1990s. Here is a chart showing Japan’s stock index, the Nikkei 225 (orange line), alongside the country’s interest rates (teal line). As you can see, the Nikkei 225 peaked in 1989 at 38,000. Since then, Japan has lowered interest rates and taken on increasing levels of debt in an attempt to improve the economy. According to the stock market at least, it hasn’t worked. 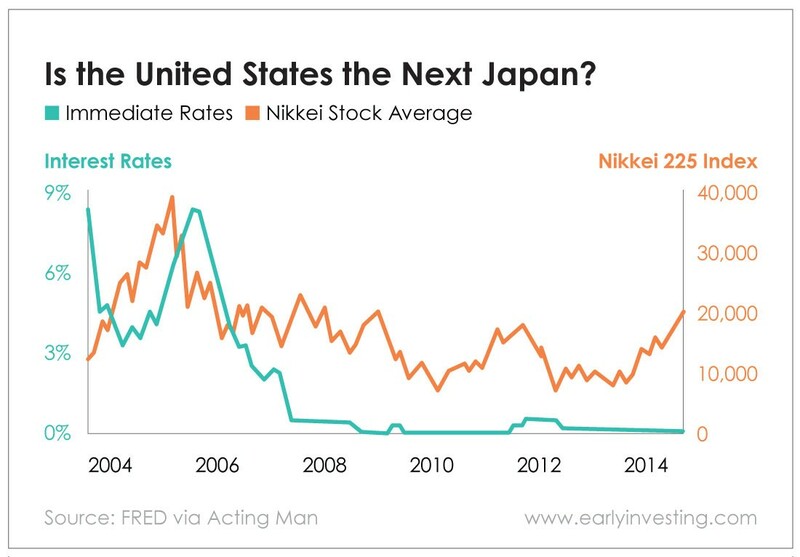 Rate cuts became less effective over time and certainly haven’t delivered stock returns for Japan over the long haul… In light of this, the fact that the U.S. central bank is now hinting that low rates will boost asset prices is worrying. 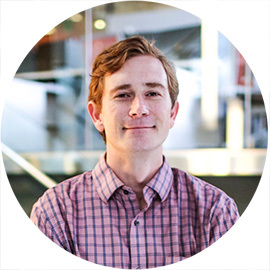 Let’s see… big deficits, low interest rates and soaring debt. In some ways, it looks a lot like the U.S. But are we doomed to the same fate? A stagnating stock market for multiple decades? We could be. As the government spends more and more, the economy becomes less efficient. I believe that when you use artificially low interest rates to keep a debt bubble going, it distorts the economy and prevents real growth from happening. The government gets into the business of picking winners and losers, which is never good. However, there are two big differences between our economy and Japan’s during the 1990s. First, it has a strong export economy, and so has benefited from a weakening currency. We don’t have that in the U.S. anymore. The second important difference is the U.S. dollar is the world’s reserve currency. This gives us more leeway to borrow and print money (digitally). But in the long run, I don’t think having the dollar as the world’s reserve will be a net benefit. The strong dollar is one of the primary reasons we lost our export economy. 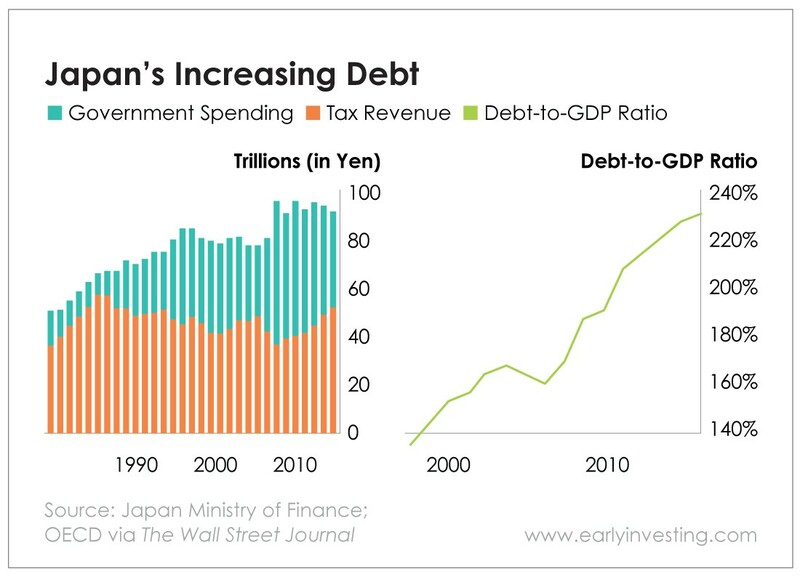 I think the real lesson we should learn from Japan is this: It never dealt with its debt and deficit crisis. Japan kept putting it off, kicking the can further down the road. The central bank kept lowering rates a little bit more and buying more assets. All to put off the day of reckoning. If we don’t face up to our own debt problems soon, I believe we’ll follow a path very similar to Japan’s, or worse even. The reason I say it could be worse is that Japan’s deficit spending has largely focused on infrastructure, building high-speed trains and such. Much of our deficit spending has been on war, which has a terrible return on investment in all senses. We can still fix the U.S. economy, but it will require difficult choices and sacrifices. Do you think that’s likely to happen in this political environment? I don’t. Either way, it won’t be the end of the world. But I believe that if things continue as they have been, we’re not likely to achieve anything near our growth potential. This is why I’m much more bullish on emerging market stocks than on U.S. stocks as a whole. Of course, there will be bright spots in the U.S. economy, such as cannabis and disruptive startups. Until this financial situation is resolved, however, I’m steering clear of broader markets.